The Ozeki DC Motor Driver is a modified Arduino Nano, that was built to drive upto 2 DC motors with the L298 motor driver. This is an open source board, with all the files needed for manufacturing. You may also freely modify the design. 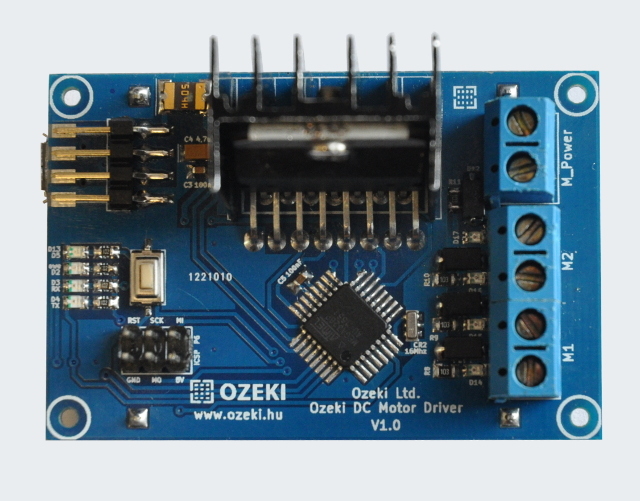 The Ozeki DC Motor Driver contains an ATmega328P microcontroller so you can program it just like an Arduino Nano using the Arduino IDE environment. It has a micro USB port, which is compatible with mobile phone USB cables. It is better then using an Arduino Nano, because it is more compact solution, since the RF modules are soldered directly to the board. Connect the DC motors to the Ozeki DC Motor Driver as shown below. You can control two DC motors with this simple code. It controls both DC motors in the same way. The code start by slowly speeding up the motors until they reach the maximum speed and then they slow down and stop. At this point they suddenly reverse direction, slowly speed up and slow down again. This cycle continues infinitely until there is enough power resource to do it. In the video the left motor is stronger, but the right motor is faster. All of the Ozeki Processing Modules have ATmega328P or ATmega2560 microcontrollers integrated. Ozeki Modules can be connected to eachother like pieces of blocks. The connection is provided through USB to each module. They have M2 screw holes to give you an option to screw them on an Ozeki Matrix Board.